Staying with the theme of conflicting signals, today's two US manufacturing reports are pointing to opposite trends for November activity. 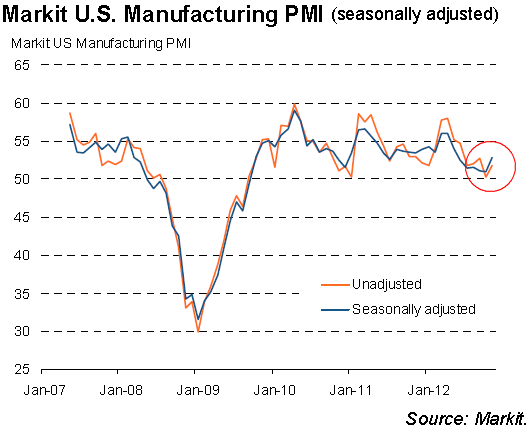 We start with the Markit PMI report which says that the US manufacturing expanded last month. Markit: - The expansion of the U.S. manufacturing sector gained traction in November, with the final Markit U.S. Manufacturing Purchasing Managers’ Index™ rising to its highest level in six months. At 52.8, up from 51.0 in October, the PMI was higher than the flash estimate of 52.4, and signalled a moderate improvement in overall business conditions. So far so good. 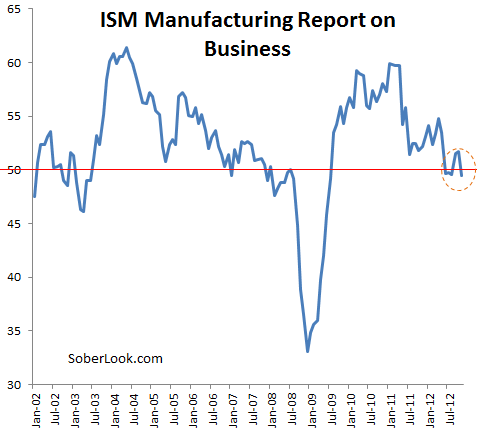 But another report, the ISM PMI showed something quite different. This ISM index used to be called the NAPM Survey. Some older traders still lovingly refer to it as "napalm" because it was known to move markets. The index, which has been around since 1948, shifted from expansion in October to contraction in November and came in at 49.5 vs. 51.7 consensus. It shows a rather sharp deceleration in new orders, further slowdown in manufacturing employment, and increasing weakness in exports. One positive aspect of the report showed that both the manufacturers and their clients have been shrinking inventories. Assuming these inventories will need to be replenished, manufacturing activity would pick up at a later date. 1. The markets clearly responded more to the ISM index, with the Dow dipping below the broadly watched 13,000 technical level. 2. JPMorgan's Global Manufacturing Index now uses the Markit PMI measure rather than the ISM report as the US component for the global index. Their view is that the ISM measure is a bit incomplete and tends to be more volatile. JPMorgan: - Close followers of the global PMI may notice that the previously published history of the survey has been revised. This reflects the transition to using data from the Markit survey of US manufacturing from February 2010 onwards. 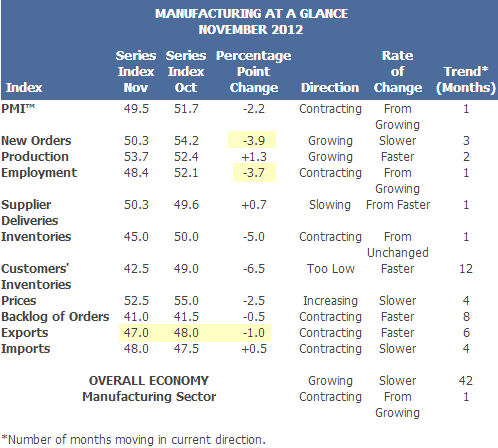 Data prior to that date are still based on data obtained from the ISM US manufacturing survey. The change imbues the global survey with an additional measure of consistency and rigor. (As an example, we already had incorporated Markit’s US index of finished goods inventory in the global survey, since the ISM survey does not include this question.) Over the past year, the levels of key US indicators, including the indexes of production and orders, have been very similar in the Markit and ISM surveys. However, the Markit versions of these indicators have exhibited far less volatility than their ISM counterparts. By extension, for the past year or so, the main difference in the global PMI now compared to before is its lower level of volatility. 3. There is sufficient noise in the data from Hurricane Sandy to cause some inconsistent results, particularly with seasonal adjustments. 4. No matter how you slice it, US manufacturing growth remains anemic. However both indices show broad reductions in inventories. The uncertainty emanating from Washington is putting orders on hold. With a reasonable resolution to the fiscal issues in place, US manufacturing could improve substantially. Until then manufacturing is in the "wait and see" mode.